The National Labor Relations Board vacated a decision overturning one of the Obama administration's most controversial rulings following an ethics complaint against a Trump appointee. The NLRB, which settles labor disputes and oversees union elections, announced it will set aside its 3-2 decision in Hy-Brand, which reinstated longstanding precedent governing joint employment. In 2015, the Obama-controlled board ruled in Browning-Ferris Industries that parent companies could be held liable for labor violations committed by franchisees or subcontractors—dismissing decades of legal theory that umbrella companies must be directly responsible for workplace infractions. The announcement came days after the agency's inspector general released a memo saying Trump appointee William Emanuel should have recused himself from the case because his former law firm, Littler Mendelson, had handled joint-employment cases. "Because the Board's Decision and Order in Hy-Brand has been vacated, the overruling of the Board's decision in Browning-Ferris Industries … set forth therein is of no force or effect," the agency said in a release. The board's three other members, two Democrats and one Republican, voted unanimously to prevent the ruling from going into effect, citing "the determination by the Board’s Designated Agency Ethics Official that Member Emanuel is, and should have been, disqualified from participating in this proceeding." Emanuel did not participate in those deliberations, according to the agency. Inspector General Dave Berry said in his memo that although Emanuel's firm did not participate in the Hy-Brand case, its representation in Browning-Ferris warranted recusal. Berry based his analysis on the fact that former chairman Philip Miscimarra used his dissent in the 2015 decision as the basis for the Hy-Brand ruling. "It is now impossible to separate the two deliberative processes," Berry wrote. "The Board's deliberation in Hy-Brand, for all intents and purposes, was a continuation of the Board's deliberative process in Browning-Ferris." Some critics in legal circles questioned Berry's interpretation of ethics guidelines. Former NLRB chairman Donald Dotson said the memo's approach to recusal is broad enough to prevent any experienced labor attorney from ruling on labor issues to avoid conflicts of interest charges, despite the memo's insistence it applied only to Hy-Brand. He accused Berry of stretching ethics guidelines to protect the Obama board's pro-union approach to labor law. "The IG's analysis is clearly tortured and partisan," Dotson said. "I do not believe the fact that Mr. Emanuel's former firm handled a case involving the same issue disqualifies him from ruling on that issue in a later case. If that were the rule it would severely and unnecessarily limit the scope of cases an experienced labor lawyer could rule on. The same would be true of former union or corporate labor lawyers." Labor activists praised the board's decision to vacate the decision. Christine Owens, executive director of the pro-union National Employment Law Project, called the unanimous vote "the correct outcome" due to "the highly unusual findings by the Board's inspector general." "The NLRB is not above the law when it sets forth rules on how employers treat workers today," Owens said in a statement. Industry groups said the board's partisan fluctuation and sweeping reversals of rulings demonstrate the need for legislation. The International Franchise Association has pushed Congress to pass the bipartisan Save Local Business Act, which would codify the pre-Obama understanding of joint employment and take it out of the hands of regulators. The House passed the bill 242-181 in November, but the Republican-controlled Senate has yet to take action on it. IFA spokesman Matthew Haller said in a statement that throwing out Hy-Brand "raises the level of urgency for the Senate to act." "We are hopeful senators can step into the breach created by [the NLRB's] decision and exercise their right to codify a definition of joint employer for small business owners everywhere and end the constant ping-ponging back and forth of this issue," he said. The Monday announcement comes at a key time for the agency. Republicans and Democrats each have two representatives on the board after Republican chairman Philip Miscimarra's term ended in December. 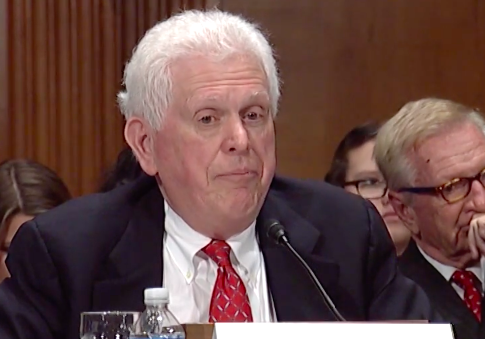 Trump's third nominee to the board, John Ring, a management side attorney with Morgan Lewis, will appear before the Senate Committee on Health, Education, Labor, & Pensions on Thursday. This entry was posted in Issues and tagged Big Labor, Obama Administration, Unions. Bookmark the permalink.